I don’t think there’s any point in beating around the bush for this one: “Alvin & The Chipmunks: The Squeakquel” is pure garbage. It’s the worst kind of kids entertainment, being neither funny or imaginative. It inspires no kids and rips off the parents at the same time. Even Jason Leemust have realized what a bad movie this was, as his character (Dave) shows up in less then ten minutes of the film. Long enough to get onscreen, break his leg, and make one minute cameos a few times during the film. After this though we need the chipmunks to actually do something, so Dave signs them up for school, saying he wants them to be “just like regular kids.” This is pointless though as not only are they not kids, but I don’t know what a chipmunks career options would be after the hit band stops being a hit. 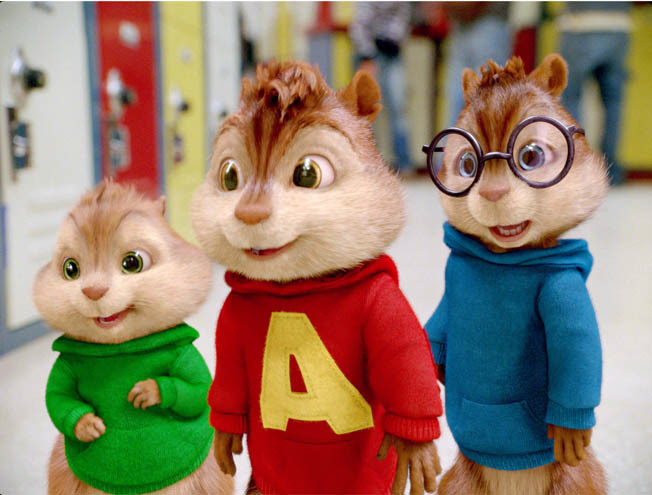 Was forcing the chipmunks to live in nature just too mean sounding for the producers? I digress though, for if this movie doesn’t care I’m not sure why I should either. 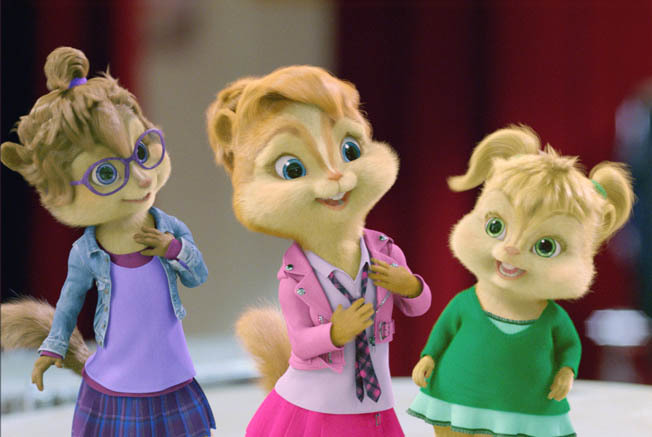 Evil record produver Ian Hawk (David Cross) is back to give the chipmunks trouble by showing off his new singing group The Chipettes. Like the chipmunks they are color coded and psyically matched up. 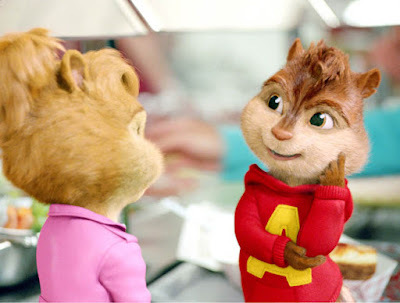 So you know, the fat girl loves Theodore, the nerdy girl loves Simon, and the beautiful girl loves leading munk Alvin. Not only is this movie boring, but it’s going for the most offensive romance stereotypes. Why must the fat people only love fat people in kids films? Never mind. The Chipettes are also voiced by celebrities Christina Applegate, Anna Faris, and Amy Poehler. I must ask again though: What the heck’s the point of all this when all the producer does is speed up the soundtrack to make them all sound the same? All the millions spent on hiring these voice actors could have been saved and then donated to the Haiti cause or something. What I have to say won’t matter though. 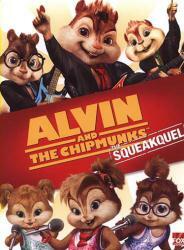 As I write this “Alvin & The Chipmunks: The Squeakquel” is a huge hit. It’s made more in it’s opening weekend then “Where The Wild Things Are,” “A Christmas Carol,” AND “The Princess and the Frog” made in their opening weekends COMBINED!!! I just don’t know what to say to that. I mean, kripes, are people just that stupid? Both of these chipmunk movies combined can’t match the value and entertainment found in just one of the movies I just listed. Sad to say, but the success of Hannah Montana is just slowly starting to make sense. Kids these days just don’t have any respect for themselves. 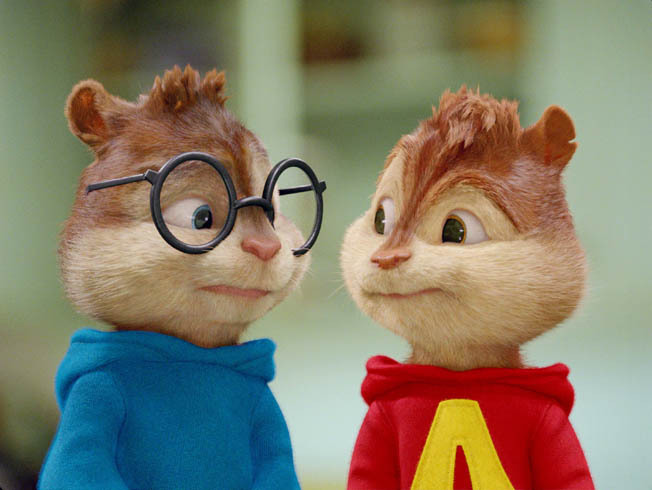 Though, I guess if my parents took me to “Alvin & The Chipmunks: The Squeakquel” then I guess my self-esteem and respect would be pretty low as well. Thank God there’s Pixar. Otherwise quality family entertainment wouldn’t make any money these days. Parents have little to worry about with this film. There is no noticeable language, the violence is all slapstick. Recommended for ages 5 and up.